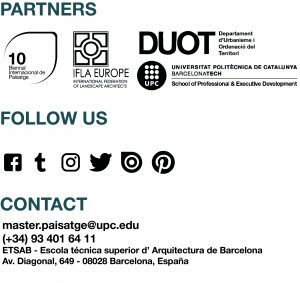 THE PROJECT OF PUBLIC SPACE – Master in Landscape Architecture Barcelona – Universitat Politècnica de Catalunya – 35ª EDITION. Studio work pursues tools for an efficient academic response to the issues set around free space through practice supported by a contrasted body of theory, as well as design presentations or that of exemplar propositive attitudes and technical knowledge and research on new disciplinary fields. The proposed exercises, can be design of urban strategies, unoccupied sites, the beach and coastline, membranes in between landscape units, highways, itineraries, terrain-vagues, or in general, places of “opportunity” to design. All the above focused from an interdisciplinary and transversal point of view and developed at the corresponding scales. Related theoretical subjects: History of Landscape Ecology, Gardening Techniques, Sociology, Construction and Services. First studio of the module Public space. Is held over six weeks, with classes Tuesday and Wednesday from 15:30 hs. to 20:30 hs. The workshop will proposed a project on not-built spaces whether inside or on the outskirts of the contemporary city. We will work on three topics, such as cultural references, design elements and analysis of existing spaces. Second studio of the module Public space. Is held over six weeks, with classes Thursday and Friday from 15:30 hs. to 20:30 hs. This second part of the studio will focus on the change of scale and approach from the analysis strategy at scale 1:5000 going down to the world of the constructive details up to scale 1:20. – Acknowledge and analyze different kinds of public spaces within the city, from a contemporary approach. – Train skills to recognize urban green infrastructure systems and to apply design strategies in order to improve and change the traditional urban model. – Acknowledge urban ecology criteria, modern urbanism and social values. – Approach and define to the concept “Urban Project”. – Acquire meaning and definition criteria of specific details in the Urban Project. – Understand and implement techniques, materials and selection of elements that compose the urban contemporary landscape. – Learn from interdisciplinary team woks and rely on individual professionals from different fields. – Explore the market in order to find the specific products that match the project objectives. The conceivable equilibrium between daily work and evening rest has been broken, the Man, on its titanic struggle to break the seal of an established millennial cycle, has extended the day. If the night becomes an extended opportunity for working, for leisure, the evening has become the inevitable space. The city grows out of its industrious character; a Factory, a warehouse, an office, a marketplace, all of them becoming theaters, monuments, fashion shows, promenades where we all stroll, as well as our visitors. Forums, Factories, warehouses, offices, shops, hotel bars, parking, all centrifuge around the city. Diasporas that emerge during the day through their trivial architecture; anonymous, vacuous, banal, out of context, disproportionate and in some cases even illiterate and ignorant. Emergency landscapes. Badly dressed, amiss made-up and poorly hidden. However, all cats are grey in the dark. During the night, everything seems to be on a different disposal, a new make-up for our eyes vision. From the subtlety of a lit up graphic to the parsimony of the street lamp rhythm, the illuminated landscape confers a more precise order and a suggestive chaos. From top views: hearts, arteries and veins are revealed, just like an x-ray. Something hardly perceivable during daytime. Trails disclosed sites ranked, faraway places linked together. The light defines the boundaries of a vivid territory and it qualifies it. Precision that the day has never known, the limit where urban finds the rural. The night is also exaggerated with human fluctuations; landscapes get deserted or saturated. In an era where leisure occupies more and more plots of our time, the night, is a key topic, an opportunity to transform or modify the reality that surrounds us. We will work on the night landscape. How to underline it, how rank it, how to find its own laws, a tool that can build landscapes. A field for a time that devours its own technology, a time that expires its own forecast. It is a field consubstantial to the observation of landscape and architecture and from a diametrically opposed nature.